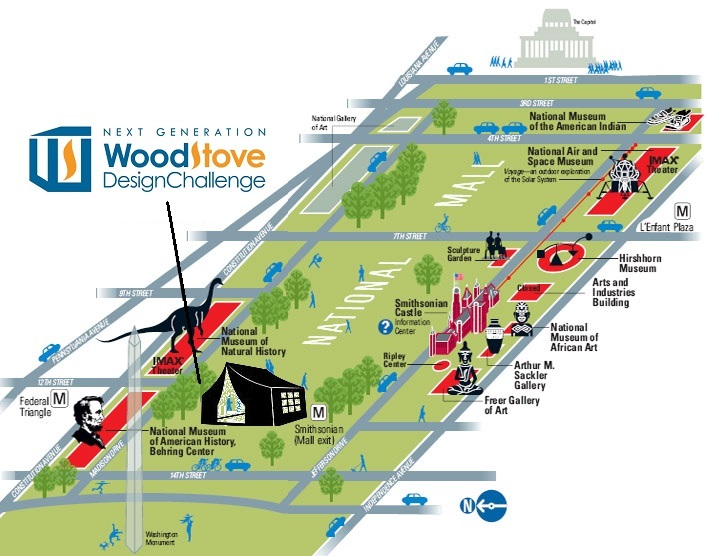 The Wood Stove Decathlon will be held on the National Mall in Washington D.C .from Friday November 15th to Tuesday the 19th. Modeled after the DOE’s Solar Decathlon, the Wood Stove Decathlon is an international competition to design and build the most innovative and affordable next generation wood stove. The Decathlon will be open to the public. The Wood Stove Decathlon will be in a large tent on the National Mall in front of the Whitten USDA building, near the Smithsonian metro station. Fourteen teams have been selected by the judges to compete for a grand prize of $25,000 and for several other prizes. There is also an audience award and you can cast your vote now for what you think is the most innovative stove. This will be the first high profile technology competition for wood stoves since Ben Franklin’s time, when deforestation compelled a drive for more efficient stoves. Today, the main driver is particulates and the need to reduce levels of smoke. The biggest breakthrough in modern times was the pellet stove, which was invented in Washington State in the 1980s and has become far more popular in Europe than in the U.S. For wood stoves, there could be major breakthroughs with automation – microprocessors and low-cost sensors that will maximize efficiency and minimize emissions. The primary sponsors so far include NYSERDA, the US Forest Service and Schott Robax glass. Partners include Popular Mechanics magazine, DOE Brookhaven National Laboratory and the states of Washington and Oregon. The sponsors and partners seek to identify and popularize technology trends that can lead to far cleaner and more efficient home heating. An awards ceremony announcing the winners and discussing the technology will be held on Tuesday, November 19th. See the Wood Stove Decathlon web page for any further information. How can the EPA encourage innovative new technologies? This webinar is being held in the lead up to the Wood Stove Design Challenge, a national competition to promote extremely clean, efficient, innovative and affordable cordwood technology. Although there will be a Question and Answer session, questions are requested in advance and should be submitted to info@forgreenheat.org by COB Monday, May 6. This webinar is co-hosted by the Biomass Thermal Energy Council and the Alliance for Green Heat. Will this NSPS drive innovation by requiring industry to meet strict emission limits? Send any questions to info@forgreenheat.org. 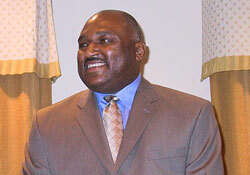 John DuPree, the lead compliance officer at EPA for wood stoves, tragically died on Thursday, April 4. He was 48. John had worked on the wood stove program for about 8 years and was widely admired and respected by industry leaders. Chris Neufeld, a Vice President at Blaze King, who attended the funeral in Alexandria, Virginia, recalled how John understood the nuances of stove manufacturers. John was the one who issued certification papers after stoves were tested at EPA accredited test labs. And he was also the one who would conduct unannounced spot checks on stove factories, to ensure that manufacturers were complying with record keeping and other requirements. John had just volunteered to serve on a Task Force that the Alliance for Green Heat had initiated to help integrate wood stoves into home energy audits. The pellet industry has been developing certification standards to ensure that consumers know the quality of the pellets they are buying, but a similar issue is being overlooked when it comes to the equipment that uses the pellets—the efficiency of the stoves. There is virtually no credible information available to consumers that indicates which stoves are extremely efficient, and which are pellet guzzlers. The federal and state governments should be clamoring for this information, because pellet stoves and boilers are the biomass heating appliance that most deserves incentives, and incentives are almost always tied to efficiency. Tens of thousands of energy audits happen every year, but wood and pellet stoves are almost always left out of them. The Alliance for Green Heat took this on, challenging energy audit institutions to justify overlooking such a critical piece of heating equipment. The leading institution in this space, the Building Performance Institute, agreed to work with us to develop standards. We then invited key industry and government experts to be on a BPI Solid Fuels Task Group, a sub-group of a BPI working group (WG-7) addressing the development of BPI-1200 Standard for Basic Analysis of Buildings. BPI is an ANSI-accredited standards development organization, which means that the procedures used by BPI meet essential requirements for openness, balance, consensus and due process. As part of that process, the Solid Fuels Task Group has begun the important but tedious task of developing standards that will then be published for public comment. The Solid Fuels Task Group is made up of John Ackerly of the Alliance for Green Heat, John Dupree of the EPA, Rod Tinnemore of the Washington State Department of Ecology, Ashley Eldridge of the Chimney Safety Institute of America, John Crouch of HPBA, Rick Vlahos of the National Fireplace Institute and Mike O’Rourke of TBHI Presentations. From BPI, key people are John Jones, Darlene Welch and Jeremy O’Brien. Our Task Group addresses the solid fuel components for the Combustion Appliance Testing section of BPI-1200. BPI-1200 provides the step-by-step procedures for conducting an evaluation of the home that addresses energy usage, and limited aspects of building durability and occupant health and safety. The evaluation will provide a comprehensive scope of work to improve the home and will include a cost-benefit analysis. Key issues to be addressed by the Solid Fuel Task Group surround how to assess the safety and efficiency of a wood or pellet stove and how to educate and urge the homeowner to upgrade or repair old or poorly installed appliances. In August 2012, the New York Biomass Energy Alliance wrote to NYSERDA asking for answers about how and why wood stoves could be excluded from the energy audits that they subsidize, particularly in the northernmost counties. For more background about the need for this standard, click here. Alliance for Green Heat, April 1, 2013 - The EPA released information about the New Source Performance Standards (NSPS) this month after making many changes to accommodate state demands for cleaner stoves and boilers. The new draft NSPS will do little to make most wood and pellet stoves cleaner until 2017 or 2019 but will have immediate impact on biomass boilers. All classes of heaters will have to meet stricter “best systems” emissions standards in 2017 or 2019, depending on whether EPA uses a two or three-step approach. The draft NSPS appears to treat all biomass stoves, pellet or wood, catalytic or non-catalytic, the same and require that they emit no more than 4.5 grams of fine particulate emissions (PM2.5) per hour, a standard that has been in place in Washington State since 1995. The average pellet stove today emits about 2 grams per hour, already less than half of the proposed standards. Hydronic heaters, commonly known as outdoor wood boilers, would also be held to existing standards that were developed about 5 years ago. However, the new NSPS would regulate sales and installations of these appliances across the entire country, instead of just the approximately 10 states that have adopted the voluntary EPA standard. While the new NSPS may reflect the status quo in many states in the near future, it could become far stricter for both stoves and boilers. In 2019, the test method for measuring stove emissions could change, for example, from averaging four burn rates to using only the highest or lowest burn rate (depending on which one the stove has the hardest time passing). Some in the industry think this standard will be a death-blow for stove manufacturers. Other experts say it will be achievable, but the stoves that will be made may not be as appealing to consumers. The written document EPA released this month did not contain any numerical limits that industry would have to meet in the future, but Gil Wood, EPA’s lead official on this NSPS verbally shared numbers with roomful of stove and boiler manufacturers who had gathered in Orlando Florida for the annual HBPA Expo. The Alliance for Green Heat requested a copy to make available to the public, which the EPA provided. The EPA has backed off of creating a required minimum efficiency standard, which all other HVAC technology has, in favor of testing and publicly reporting efficiency to the consumer. The industry position is that reporting efficiency is sufficient and enables the consumer to decide if they want the equivalent of a gas guzzler or a gas miser as their home heating appliance. There is much speculation about how the new EPA Administrator, Gina McCarthy, will impact the NSPS. Administrator McCarthy had been head of the air quality division at EPA and has a good working knowledge of solid fuel appliances. And, McCarthy has already reportedly asked tough questions about why fireplaces are not covered in this NSPS. Many in industry are simply tired of an agency that appears to keep changing its mind about how strictly wood heating appliances should be regulated. As of last fall, EPA appeared to have something close to a final draft of the new NSPS that was more acceptable to industry but considered far too weak by many states. States now appear to have strengthened their hand. By adopting a stepped approach, the new NSPS may do little to make stoves or boilers any cleaner before 2019 in the Northeast and Northwest, where states have already adopted standards that are as strict as or even stricter than what the EPA is proposing. The most immediate impact upon promulgation, which could be in 2014, is that unregulated outdoor wood boilers would go off the market in all states. But there is a growing movement that feels even Test Method 28 WHH and standards for EPA qualified outdoor boilers still are deeply flawed, even after Method 28 OHH was improved to Method 28 WHH. It is still unclear how boilers will be tested for 2014 compliance and how existing voluntary tests will be validated. Brookhaven National Laboratory recently completed a study that resulted in a new test method being created for both outdoor wood boilers and indoor boilers that have partial thermal storage. Funded mainly by NYSERDA with some support from EPA, this method draws upon the ASTM method and Method 28 WHH. It can be used instead of Method 28 WHH for any boiler with partial thermal storage. New York State has already accepted the test method which will help open up the state up to European and American boilers with thermal storage. The Brookhaven Method is also similar to the ASTM Method 2618 and could replace that method as well, but has it has not yet been introduced into the ASTM process. The test method is more stringent than Method 28 and the European EN 303-5 but it may be a quicker and cheaper test for manufacturers to undertake. It is still unclear if the Brookhaven method could be part of this NSPS or not. That will likely depend on how much the states push for it and whether industry pushes back. The EPA’s latest timetable suggests it will have a final draft of the new NSPS ready for internal review in April and the agency will publish the standard in the Federal Register this summer. Industry, states, non-profits and the public will then have 90 days within which to submit comments. The final rule would be promulgated and go into effect in the summer of 2014. The EPA has yet to meet any of their timetables for this NSPS. There is always the chance that someone will sue the EPA simply to get a court-ordered timetable that it would have to adhere to. And, lawsuits based on substantive regulations are also possible, if not likely, from a variety of fronts, if acceptable compromises cannot be reached.